You can select the color scheme used by the Coveo Sidebar in Outlook. The Sidebar colors can either follow those of the currently selected Outlook theme or one of the predefined Coveo themes. Note: It is also possible to create a custom Outlook Sidebar color scheme (see Creating a Custom Color Scheme for the Outlook Sidebar in the Windows Registry). 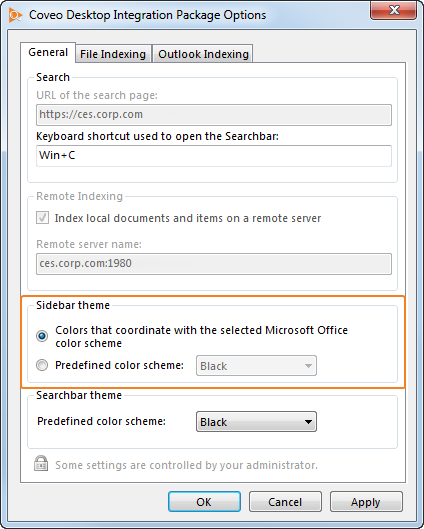 Instructs the Sidebar to take colors from the Microsoft Office color scheme that is currently selected in Microsoft Outlook. When you change the Microsoft Office color scheme, the colors of the Coveo Sidebar follow the selected theme (see the Microsoft document Change the Outlook 2010 color scheme). In the drop-down list, select one of the available Sidebar color presets. With this option, the Sidebar colors are independent from the currently selected Microsoft Office color scheme. Note: When you are upgrading from an older version of the Coveo Sidebar, an orange shading from the original Sidebar color scheme may remain in the header for all available color schemes. 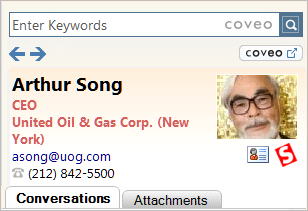 This is due to the fact that the orange gradient image is still in the Internet Explorer cache. To eliminate the orange gradient, in the Temporary Internet Files folder on your computer, delete the files for which the name contains outlook.